Elevator Parts: Looking For Elevator Doors? Fill Out Our Elevator Part Survey Forms! Looking For Elevator Doors? Fill Out Our Elevator Part Survey Forms! In the professional world, every element of your interior design needs to provide a flawless appearance to reinforce the professionalism of your brand. Shining spaces with luxurious designs can elevate the quality of your business, and it will fall on you to secure the best fit for every element in your building. If the time has come to update your elevators’ entrances, doors, and cabs, then it is essential to find a local elevator manufacturer for a precise fit and long-lasting results. Kohtler Elevators is here to serve as your source for high-quality elevator parts, combining our decades of experience to offer luxurious finishes that are sure to impress your guests and employees. We take pride in delivering the perfect fit for your existing system, and will work with you to measure up your needs before making a purchase. Elevator doors can be hard to size properly, making door surveys a key instrument in measuring exactly what is needed. Today, we’ll briefly discuss the value of our door survey forms, as well as the peace of mind you can expect from all of our products and services. Be sure to contact us today to learn more! 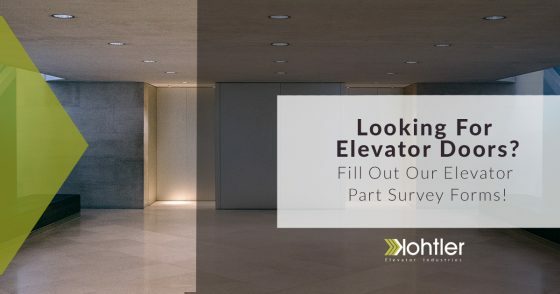 Our survey page provides all of the resources needed to fill out your elevator door form, whether you are looking for a single-slide, two-speed, center-opening, or a combination of the previous two styles. Each form provides space to make measurements and decisions, all to help us understand what you are looking for and what you have to work with. Every elevator system is different, and a personalized approach should be taken to ensure the best fit. Door height — One of the simplest measurements to take, the height of your elevator door plays a large role in sizing the cab, entrance, and more. Door panel size — The width of your panel (or panels) will also help to give our team a picture of how to deliver the best fit. Choose your form accordingly, and be sure to measure each door panel for a quality result. Door thickness — Commercial elevators rely on tight spaces to make everything fit, and the thickness of your elevator door will play a role in the design. Elevator door opening height — The entrance for your elevator door is also essential when measuring the vital parts of our survey form. Door tap sizes and spacing — The size and distance of your door taps will be required for an ideal fit to existing systems. Left- or right-handed openings — Elevator doors can open from the left side, right side, or center. Determining which door you have or plan on installing will help when choosing which form to fill out. Door drilling — Each elevator manufacturer has its own unique drilling pattern. You can choose from OTIS, MAC, or list your own drilling pattern to give us a clear picture. Elevator door finish — Customers have a range of beautiful finishes to choose from to complete the look of their elevator entrances. You can select from dozens of paint colors, Muntz copper finishes, plastic laminate, or stainless steel. Beyond the doors for your elevator cab, the hatches can also be outfitted with modern components and finishes for safety, beauty, and reliability for years to come. Investing in the entrance of your elevator door is important, but the outdated style of the interior’s hatch may spoil the luxurious look. Our team can also help you to update the other aesthetic elevator parts that comprise your system, including the entryway and cab interiors. Kohtler Elevators relies on precision manufacturing and high-quality materials to deliver long-lasting results for every operation. Why Fill Out the Form? The survey forms provided by Kohtler are clearly laid out and easy for customers to understand. You can fill out the survey and email or fax it to us for fast, convenient results. Kohtler Elevators works to provide the best outcome for every building, and our team is available for a consultation. Precision is important when it comes to achieving the most reliable and beautiful elevator systems available, and our company is here to help you find the right style for the right price. Our team is here and ready to help you find the best fit for your unique style. We rely on commercial-grade steel, high-quality laminate, and other premium materials to tailor a personalized result to match every budget. Contact us today to learn more, and be sure to fill out a survey form for the fastest service!